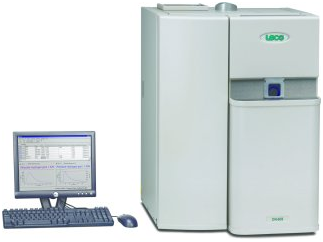 Chemical and thermal separation processes for analytical determination of dissolved or bound gases in metals or alloys. Vacuumhot extraction (VHE) with coupled mass spectrometry enables simultaneous detection of physically and chemically dissolved gases, which escapes during heating in a vacuum from the samples to be examined (see also Hot extraction processes). Besides qualitative detection of the type and characteristic gas emission temperatures, VHE can be calibrated to determine the absolute gas emission rate and subsequently the gas quantity or initial concentration after integration over the emission period. As calibration substances, usually quartz glass with a known H2 content and TiH2 with high purity are to be used (according to P. Ried, M. Gaber, K. Beyer, R. Müller, H. Kipphardt and T. Kannengießer). This process makes use of the high affinity of oxygen to carbon that is reduced to COx at very high temperatures. In this process, the samples are molten and overheated in the graphite crucible in a furnace. The emitted gases are extracted and spectrometrically recorded, measured and removed from the gas current by means of absorbers. The nitrogen that occurs under these circumstances is measured in the inert gas flow by a thermal conductivity detector. For non-ferrous metals, extraction tubes made of quartz are used. The process can be used for hydrogen, oxygen and nitrogen. For example, figure 1 illustrates a device to determine the residual and diffusible hydrogen in metals. P. Ried, M. Gaber, K. Beyer, R. Müller, H. Kipphardt and T. Kannengießer: Thermo Analytic Investigation of Hydrogen Effusion Behavior - Sensor Evaluation and Calibration, Steel ResearchInternational 82 (2011) (1), p. 14.